As you probably know, building core strength is one of the key benefits of pilates. But what you may not know is that there is a lot more to the core muscles than the abdominal or tummy muscles. 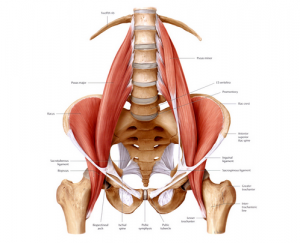 The Psoas muscle (pronounced ‘so-as’) is the epitome of the core. The spine and the muscles closest to it – including the psoas – are your core, your centre of gravity. The abdominals are also part of your core, but are more superficial than this all-powerful muscle. The Psoas muscle is one of the largest and thickest stabilising muscles; it originates all along the lower spine area from just below the ribs and attaches onto the inside of the leg (femur bone). When it contracts, it brings the femur closer to the torso (thigh flexion) – bringing your knee up to waist level, for example.Thus the Psoas is key to walking and the transfer of weight from foot to foot. However, because we spend so much time sitting (driving, in front of computer, watching TV), this long muscle often becomes shorter and weaker than it should be. When this happens and you move from sitting to standing, you first of all stand with your torso tipped forward in relation to your legs (slightly flexed at the hip); when you then go to straighten up fully, the Psoas muscle pulls your low spine towards your front body, making your lumbar curve bigger than ideal. The joints and the lumbar discs of the vertebrae of the spine become compressed, leading to degeneration and making you susceptible to injury. Your gluteal muscles may stop firing and activating normally. The gluteal (bum) muscles are other large and necessary stabilising muscles. Your hamstrings will get shorter and weaker – so you are less flexible. Taught well, Pilates works on the deep stabilising muscles. Many of these movements to sense the Psoas are low-level and simple, but must be done with discipline. When I teach pilates classes, I encourage people to become aware of the Psoas muscle, to sense how it controls leg movements and position. It’s helpful to tune into this muscle, to feel how it connects the inner groin to the pelvis and low back. I encourage people to move from centre to the outside. In pilates, the core point for energy is below your navel and above your pelvic floor (this is also one of three points in Traditional Chinese Medicine – others being the heart centre and the third eye). Paying attention to your centre and addressing muscles imbalances at your core pays many dividends down the line. Do pilates stretches and strengthening moves for your Psoas muscle on a regular basis– but not just for your Psoas muscle… work also on rectus femoris (front of thigh) and adductors (inner thigh muscles). It’s all connected! Get deeply restful in what is known as the Pilates rest pose, lying on your back with knees bent, feet flat in line with your sit bones, cervical spine supported so your neck is not extended when your head is resting on the floor. If you have to sit for long periods, make sure your torso is not tipped forward; sit back into your chair. Also keep your two feet flat on the floor (avoid crossing at the ankles). This entry was posted in Blog and tagged core, low back, Pilates, psoas, rest, scoliosis, stabilising muscles on 21 August, 2014 by Eimear.